📱 Smartphone connections continue to rise and people, globally, love to game. The Global Systems for Mobile Communications Association (GSMA) estimates that by 2025 78 percent of all developing market mobile connections will be smart. By that time GSMA predicts that India will be the second-largest smartphone market by adoption globally (ahead of the United States), with 1 billion smartphone connections. Interestingly, India is already among the top five mobile gaming countries globally, expected to surge to 368 million gamers in 2022. If this is a bellwether for developing markets, we can expect gaming to be a significant force across the global south. 🕹 Gamers are empowered learners. In 2010, game designer Jane McGonigal argued we need “21 billion hours of gameplay per week” to help solve some of humanity’s toughest challenges. Why? Because gamers are “super-empowered, hopeful individuals,” who are amazing at collaborating online and learning new things. There are some fascinating examples, such as blockbyblock, which uses Minecraft to help urban planning in Nairobi, or GRID, which sets out to affect social change with interactive apps catered to “the bottom billion.” These trends seem to get most attention in the education technology sphere when it comes to funding and policy-making decisions, but capitalizing on the power of games can cut across almost all sustainable development sectors. 🔑 The key is, the learning outcome of the game is determined by the product designer. That’s where the potential to address international development challenges comes in. Stop thinking of games in terms of ‘making Candy Crush for X,’ and start thinking of them as design patterns to inform better product design. 🐛 The Fall Army Worm Tech Prize (FAW) started us off on an unexpected path to more deeply incorporating game design into our work. The FAW prize gave us a solid agronomic basis—notably the IPM guide—on which to research a solution for our existing base of 100,000 farmers. The availability of this research and the detailed design challenges it articulated enabled us to move faster on prototyping a digital solution. 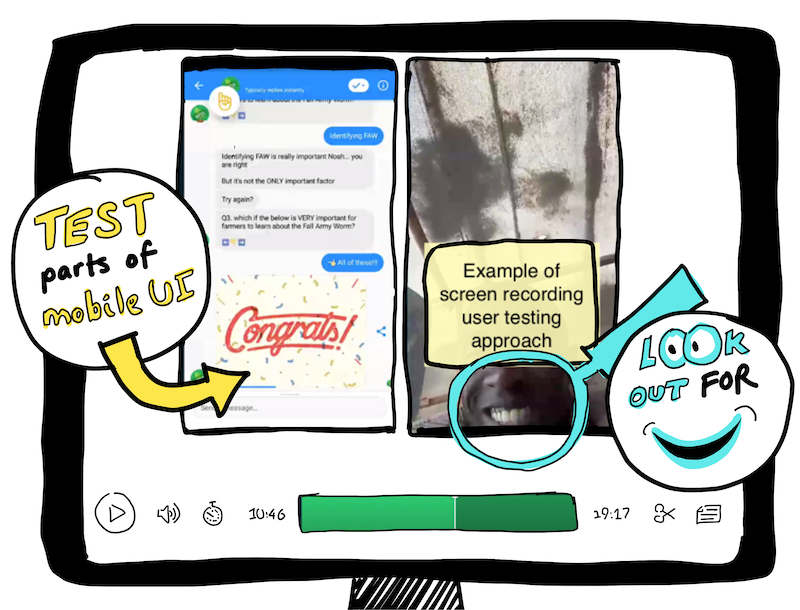 An example screen recording from our user testing of the FAW prototype (with some additional annotations). 😁 …a beaming SMILE. When a user tries something out, you really can’t miss their smile. Incidentally, some of the FAW solution prototypes we developed used simple games, and we found an abundance of smiling reactions (the example above comes from a recorded user test of our FAW prototype). This type of consistent positive reaction is what got us researching game design more thoroughly. 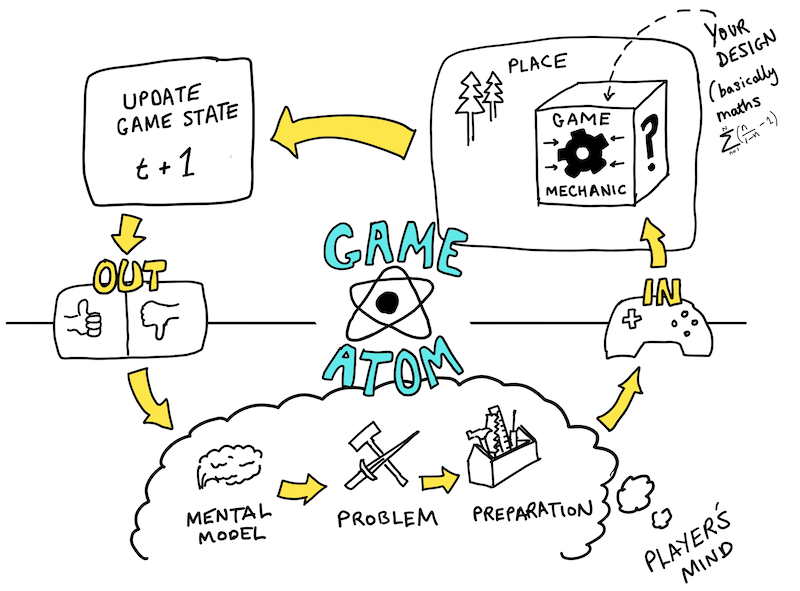 Diagram of “game atom” (my adaptation of Koster’s diagram). 🖇How can we practically incorporate this concept? At the heart of Koster’s talk, is that games are best understood mathematically. There is a wealth of understanding already developed around such mathematics and game mechanics that can be used in the sphere of digital development. If you want to get a flavor of what core mechanics look like in games, check out these slides on understanding game mechanics for social games (note: social here means many players together, not socio-economic impact). This just scratches the surface, but can start us on the path to a deeper understanding of games and how games can be used to address global sustainable development challenges. Of course, games are not a panacea, they are just one element to our approach to build better products for a digital farming audience. But they are powerful, and something with great cross-cutting potential into the area of digital development. 📩 Interested in keeping tabs on our thinking on topics like this and our journey incorporating these ideas into our digital farming products? Subscribe to our newsletter here. Adam is one of the co-founders of farm.ink.